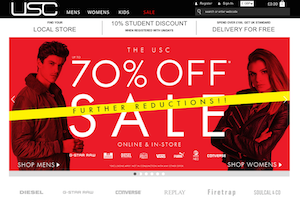 USC, like recently collapsed Bank Fashion, was over-reliant on also-ran noughties brands. On the high street it’s pretty clear who the winners and losers are at the moment. USC, owned by Mike Ashley’s Sports Direct empire, is now firmly in the latter category, after setting the ball rolling on insolvency proceedings that could see a swathe of stores shuttered. The fashion chain’s directors, including Sports Direct chief exec Dave Forsey, filed its intention to appoint receivers (the court officers that look after creditors’ interests) at the High Court yesterday, according to the Telegraph. That gives USC up to 10 days to officially declare insolvency. The worst-performing third of the retailer’s 90 stores, which employ about 1,000 staff in total, are reportedly set to close. Around 100 workers at a USC warehouse in Scotland have apparently already been made redundant, without even being given a reason. Sports Direct bought 80% of USC, and smaller fashion chain Cruise, for £7m in 2011, from Mike Ashley’s rival-turned-friend and fellow tycoon Sir Tom Hunter. It makes up the majority of the FTSE 100 company’s ‘premium lifestyle’ division, along with what’s left of Republic, which Mike Ashley snapped up in March 2013 when it too collapsed. USC’s latest troubles were triggered by fashion brand Diesel’s demand for unpaid debts, which it decided it can’t afford to pay, according to the court documents seen by the Telegraph. Diesel broke off its 15-year relationship with the retailer last year and Adidas also pulled its Originals shoes from stores. What’s with all the handbags at dawn, then? USC sells next to no own-brand items and has reportedly irked its suppliers by buying clothing at discounts of up to 50% and then stockpiling it. It all sounds very similar to the tactics of Sports Direct itself – play hard-ball with brands, or even buy them up, as it has done with everything from Dunlop to Donnay. Then sell it at bargain basement prices (in stores that are effectively bargain basements). That doesn’t seem to have worked for USC and Republic: sales in the six months to 26th October fell 2.8% to £99.9m, while it made an EBITDA loss of £7.8m. That was less than the previous year’s loss of £11.9m but still, so much for ‘premium lifestyle’. As a 20-something woman who pays some attention to what I put on in the morning, I’d hazard a guess that brands such as Diesel, as well as Sports Direct-owned ones like Goldigga and Firetrap, were the height of fashion some time around 2005. I have never shopped in USC, Republic or Bank Fashion, which collapsed on Monday, for that matter, all of which go for the mini department store model. Fashion, as Mike Ashley may have figured out, is a whole different ball game.